If you are still playing the flute you first rented or purchased for beginning band and it has been more than 3 years, you might consider purchasing what is commonly called a Step-Up flute. This can be an intermediate or professional flute, depending on your budget. How do I know I’m ready for a Step Up flute? You should notice a big difference in how well the flute plays and feels when you are ready for a step-up flute. What should I be looking for when purchasing an intermediate or professional flute? Having open holes where your fingers touch the keys makes it necessary for your fingers to cover the holes. This not only encourages proper hand and finger position but it also allows for later development in learning modern extended techniques. The B foot allows you to play Low B. Its Gizmo lever allows you to close the low B key without closing the C key easily. The Gizmo key is also known as a High C facilitator since it is used to make the highest C more in tune and easier to play. The headjoint is one of the most important aspects of a step up flute. How the hole is cut is very important for how a flute plays and sounds. Your beginner flute headjoint was designed to help you just get your first sound. A step-up flute headjoint is designed to produce a mature flute tone and aid in performing fast articulation now that your embouchure has developed. Sticking with a student cut can hold your progress back while a step up or professional cut will allow you to continue development of powerful tone and effortless articulation now that your embouchure is stronger. What are the options available that can be chosen? A series of step-up flutes share the same design from maker to maker but vary in how much silver issued for the tube. A student model is all nickel silver and then either nickel or silver plated. Step up flutes offer either a silver headjoint and plated tube or an all silver tube where the headjoint, body, and footjoint are all silver. The closer you get to the embouchure hole, the more important silver content adds to the overall effect. As the silver content increases, so does the price. Silver content on step-up flutes is introduced on the headjoint first and the body tube second. Remember that the design is more important: the amount of silver in your flute serves to enhance that design. You’ll still receive the step-up flute design benefits but the amount of silver you choose to enhance the effect depends on how much you can afford. 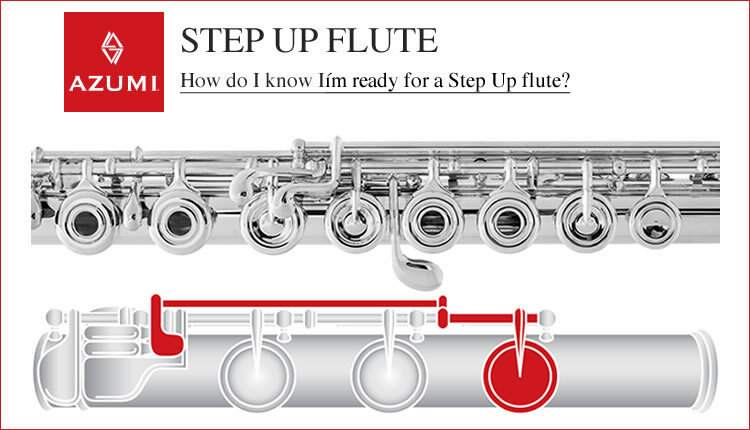 Step-up flutes are offered with your choice of the double G key placement. This is entirely dependent on ergonomics and your comfort with where the G key is placed. Off-set G is the most popular and if you have smaller hands or short fingers, it will be more comfortable. The placement of this key does not affect the sound of your flute so choose the style that is most comfortable for your hand. The split E mechanism allows the lower key of the double G key to close when playing High E. Normally;the double G keys operate linked together. This creates a venting problem only when playing High E. For this reason, High E is less stable and also quite sharp. A split E mechanism “splits” the double G key to operate the lower one independently. The lower key is automatically operated by the E key, hence the name “Split E”. This corrects the venting problem created by the traditionally linked G keys making High E more stable and in tune. The split E option on step up flutes almost always includes an Offset G key. Offset G keys are more stable than inline G’s on step up flutes where there is a Split E mechanism. Another option is the High E Facilitator. It is just a donut or crescent shaped disc inserted into the lower G key tone hole, providing a less expensive alternative to a High E mechanism. The facilitator helps the High E venting problem partially compared to a Split E mechanism but it is much less expensive and an acceptable compromise for many players. We hope this information is helpful as you search for a new Intermediate or professional flute. Please check out the following pages for more information on Jupiter, Azumi and Altus flutes for your next purchase!